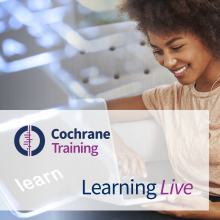 These videos, originally part of the Cochrane Learning Live webinar series, introduce individual patient data (IPD) meta-analysis. Dr Sarah Nevitt from the University of Liverpool, UK, explains the differences between IPD meta-analysis and aggregate data meta-analysis and when IPD meta-analysis is the best approach to use. She provides examples of IPD meta-analysis and discusses practical aspects of retrieval of IPD from different sources such as pharmaceutical sponsored trials, publicly funded trials etc. Finally, she addresses the question of what to do when not all IPD is available for analysis. This webinar was organized by the Cochrane Statistical Methods Group, with support from Cochrane's Membership, Learning and Support Services. The webinar was delivered in November 2018. Below you will find videos from the webinar along with the accompanying slides to download [PDF]. Part 1: IPD meta-analysis: What, when, why? Dr Sarah Nevitt has a background of Mathematics and Statistics; with a BSc from the University of Liverpool in Mathematical Sciences with a European Language, an MSc in Medical Statistics from the University of Leicester and a PhD in Biostatistics from the University of Liverpool. Her doctoral thesis examines the impact of data sharing and data transparency on the conduct of individual participant data syntheses. Within her role at the Department of Biostatistics, she supports Cochrane authors on as the Statistical Editor of the Cochrane Epilepsy Group and she has authored eight IPD reviews in Epilepsy. She also has experience of Health Technology Assessment, Single Technology Appraisals, analysis of clinical trials and statistical consultancy.